Categories: Main dish Sauces Meats Yield: 4 servings 1 c Catsup 2 tb Brown Sugar 1 tb Lemon Juice 1 tb Worcestershire Sauce 1 ts Prepared Mustard 1/2 ts Onion Salt 1/8 ts Pepper 8 oz Cooked Roast Beef * 4 ea Hamburger Buns Split * Roast Beef should be thinly sliced and there should be 8 to 10 slices. Mix catsup brown sugar lemon juice worcestershire sauce mustard onion salt and pepper in 2-cup glass measure. Microwave uncovered on high (100) 1 1/2 minutes; stir. Microwave to boiling 1 to 2 minutes. Layer half the beef slices and half the sauce in 1-Qt casserole; repeat. Cover and microwave on high (100) until hot and bubbly 1 1/2 to 2 1/2 minutes. Place bottom halves of buns on serving plate. Top with beef and reamining bun halves. Microwave uncovered on high (100) until buns are hot 30 seconds to 1 minute. Categories: Main dish Meats Sauces Yield: 4 servings 1/3 c Catsup 2 tb Vinegar 2 tb Finely Chopped Onion 1 ea Finely Chopped Garlic Clove 1 1/2 ts Worcestershire Sauce 1 ts Packed Brown Sugar 1/8 ts Dry Mustard 1 ea Dash Pepper 2 c Cut-up Cooked Beef 4 ea French Rolls Split 4 ea Slices American Cheese Mix all ingredients except beef rolls and cheese in 1-Qt casserole. Cover and microwave on high (100) util hot and bubbly 2 to 3 minutes; stir. Mix beef into sauce. Cover and microwave until beef is hot 3 to 5 minutes Fill rolls with beef mixture and cheese slices and serve. Categories: Main dish Fish Yield: 4 servings 2 ea Hardcooked Eggs Chopped 6 1/2 oz (1 cn) Tuna Drained 4 oz Shredded Cheddar Cheese 1/4 c Chopped Green Pepper 2 tb Finely Chopped Onion 1/2 ts Prepared Mustard 1/2 c Mayo or Salad Dressing 8 ea Hamburger Buns Split Mix eggs tuna cheese green pepper onion mustard and mayonnaise. Fill buns with tuna mixture. Place on serving plate. Microwave uncovered on high (100) until filling is warm 1 1/2 to 2 mins. Categories: Main dish Yield: 4 servings 3 ea Large Hard Cooked Eggs 2 tb Mayo Or Salad Dressing 1/2 ts Prepared Mustard 1 ea Dash Of Pepper Cut eggs lengthwise into halves. Slip out yolks and mash with a fork. Mix in remaining ingredients. Filltes with yolk mixture heaping it up lightly. 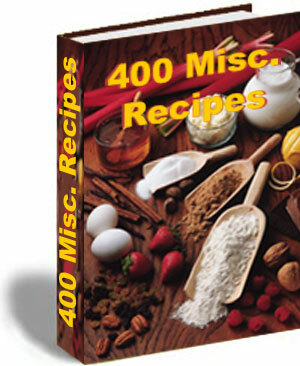 400 miscellaneous recipes is delivered in PDF format and is viewable on any computer. All you need is "Adobe Reader" or "Acrobat eBook Reader" which is available free and already on most computers. If you do not have it installed on your computer Please Click here to get the software. They are both Free.